Welcome to TMG: Wicked Cool Toys Present The New Cabbage Patch Kids Line and Baby Alive! 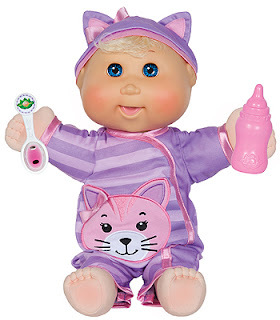 Wicked Cool Toys Present The New Cabbage Patch Kids Line and Baby Alive! Wicked Cool Toys has a great way of reinventing toys for our childhood and bringing them back to the top for our children to enjoy. Us 80’s kids all know what it was like to receive a Cabbage Patch Kid- and we all know the story of how our parents acquired them. It was even harder back in those days to get your hands on the coveted item of the year, and in the year of the Cabbage Patch there were lines all across America for the chance to get one of these dolls. My mom was visiting my Great Aunt at the time of the release of the CPK line. She remembers waiting on line for almost three hours with Aunt Anne, waiting to get their hands on one of the dolls. They laughed, and joked, almost cried a couple of times, but in the end they both had a cabbage patch doll in their hands, and a fond memory of when they got it- and I to this day have that same cabbage patch doll on my bed, and my niece comes over to play with it all the time. This doll has seen a lot of love in its time, and continues to as well. The new line of CPK which is produced under one of our favorite companies Wicked Cool Toys, bring all that is awesome about Cabbage Patch with a modern twist while keeping what makes them special in tack. The new Line Cabbage Patch Kids, have just the most amazing cloths- no joke every outfit they have I want an adult size one. Their hair is not made of yarn, but is now more like other dolls, but they do all come with the infamous birth certificate. Each doll still has the vinyl head and plush body, and is approx. the same size as my now vintage version. The new one is a bit lighter though, so you will need a little more push when you try to bash your brothers head in with it like I did whilst I was a child. (no, no I never did that. 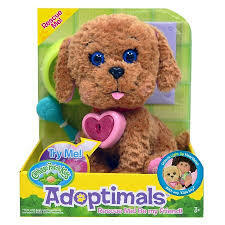 Adoptimals line- which is sold separately. The key makes their collar light up and unlocks their secret heartbeat. I think it is an adorable addition to the line, giving it a little bit of a “wow” factor and just a smidge of technology to a largely based technology free line. The pets are too scale to the Cabbage Patch Doll, and are as cute and cuddly as the doll themselves. So if you are looking for a gift that will stay with your child for the rest of their life, or to give a gift that you feel a bit of nostalgia about, may I suggest Wicked Cool’s Line of Cabbage Patch Kids and Adoptimals. Every child will absolutely love it, just as much as we did all those moons ago. The second must have Cabbage Patch of ANY season is the newest addition to the cabbage patch line Baby So Real, and baby- it is! This 14 “is fully loaded for some truly magical interactive fun! This bundle of joy is built just like your normal cabbage patch but just had a little bit of magic added to it! The ground breaking technology inside this doll holds over 30- yes thirty eye expressions, has more than 60 different sounds, and eight different sensors that let your baby really interact with their baby! From just glancing at this doll you would think that the eyes are the biggest appeal of this toy- which would have agreed with before I got to play with it myself at Blogger Bash ’16. While It does give the doll a very unique physical appearance, as well as being very eye catching an enticing target for any kid to want to pick up and play with no matter how old or whatever gender. However, it is only one of the fantastic aspects of this doll. For me and my family what made this product truly unique were the touch sensors and the reaction from those sensors from the doll. To have a doll react to being tickled with those digital eyes beaming at you and the sounds of lifelike baby joy was amazing. Seeing them rock the baby to sleep, and the eyes slowly closing was so adorable. I mean as an adult I was freaking out at how cool it was so to see the kids amazed responses was no less than ecstatic. In ADDITION to the amazing real life features of this gem of a doll, you also have the interaction with the app to look forward to. Syncing via Bluetooth easily- which is a feat itself- the app works like a virtual baby monitor. On your screen you will put in your baby’s name, and they will appear on the screen and look exactly like your baby with a little bit of editing. This app will tell your child when the baby needs feeding, a diaper change etc., when you do that action in real time it will coincide with the baby on screen. So not only will you see the digital eye reaction, but you will see the baby onscreen react with joy when you fore fill one of their needs. For every action that you complete while connected with the Bluetooth your child’s account will be filled with CPK fake currency that they can use to buy different virtual cloths or objects for the virtual room- there is no real money needed for this app- everything that comes in the box is all you need to play the app fully. A quick little detail that I appreciated- being a Cabbage Patch fanic myself is the little homage that Wicked Cool Toys put into the app for us Old timers is the old time looking T.V. that sits in the nursery with a stack of VHS’s- which I had to explain to the girls when they saw it; thanks for that- when you hit the play button it plays some videos that you might find familiar if you are an 80’s kid! There are also other aspects of the app including a cute little matching game- but mostly if your child is interested in the app they will be using it to interact with the doll. The app- which is awesome- is really just a perk of this amazing toy. You kids will love the doll whether or not you hook it up to it. The timeless aspect is not lost with this version of the CPK doll. Your child will not get tired of playing with it, just like they won’t get tired of playing with an original version of the doll, or for that matter my old one from the eighties that my niece to this day pulls out and plays with every time she is over. 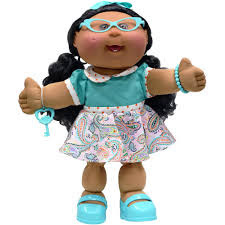 Although upgraded, it holds true to the aspects of the Cabbage Patch Kids brand that we all grew up with and loved and for that reason alone if you are on the edge about buying yet another tec toy- don’t be. It is not only worth every dollar you spend on it, but will provide hours of fun for the whole family- I promise! Thank you so much to Wicked Cool Toys for giving us this amazing doll to review, but for committing to holding onto the core values of a brand we love while working hard to make it even better than we could of imagined!